I have recently bought my first boat, and a Helix 7 SI GPS unit. With that unit I am looking at either buying AutoChart Zero Lines or AutoChart Pro. Since Pro is 2½ times more expensive than Zero Lines (here in Denmark) there needs to be a good reason to choose Pro over Zero Lines. On HB's website I cant really clearly understand what Zero Lines actually is, is it a chart used in conjunction with AutoChart Pro - to transfer maps from unit to unit. Or is Zero Lines "Some of the basic features of AutoChart Pro". I know that with the Pro version you can read bottom hardness, 3D models of the water, overlay SI mosaic and you get a computer program and all sorts of things. I do not need that. 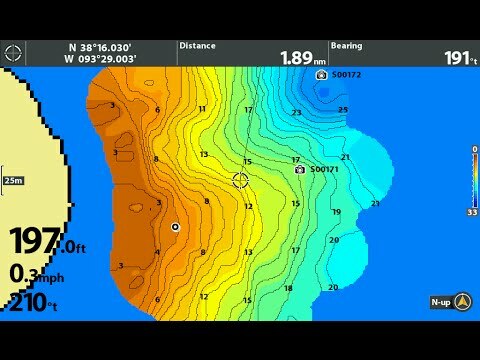 All I need is a color coded depth chart of the fjords i fish. My local dealer dident quite know what Zero Lines could actually do, he talked about the details being less on Zero Lines than on Pro - depth interval was set to 3 feet on Zero Lines instead of 1 feet on the pro version, but that just seems weird. So, help? Do I need Pro or Zero Lines? There are two AutoChart software packages: AutoChart and AutoChart Pro. Each of these packages allows you to create and edit lake maps from sonar recordings you make on some Humminbird units. AutoChart Pro has a few more features than AutoChart. A Zero Line Card comes packaged with each of these software packages. You must load your AutoChart created maps onto the Zero Line Card which is then inserted into your Humminbird unit. Without the Zero Line Card you cannot load maps created in AutoChart or Autochart Pro. You can buy additional Zero Line Cards (about $100 us) if you need more storage for created maps. If you do not have AutoChart or Pro the only use for a Zero Line Card would be to record AutoChart Live recordings if your unit has that feature. In my opinion AutoChart live recordings are not all that useful on their own. It sounds like you might need to purchase the AutoChart software (which comes with one Zero Line Card) to map your fjords.